Dazzle Camouflage was created during the first world war. 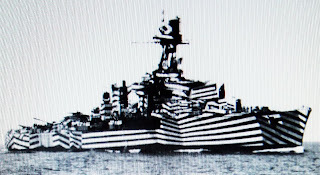 Rather than camouflage which is traditionally created to blend, to disguise the jeep or tents from the enemy, dazzle camouflage was designed to confuse the U boats. When firing on the ships, the dazzle designs confused their sights so that it was impossible to discern in which direction the boats were going , thus the torpedos often (and hopefully) missed their targets. (More text to come). These pictures are in black and white but often the dazzle designs used colour. Small designs were created to place over pictures of the ships, and the ship would be painted in the design as it appeared. A fabulous example of a ship with optical illusions created to confuse the enemy. It would be difficult to tell which way this ship was going. Boxes were designed with geometric patterns and then placed over the template of a ship. I love this idea and would love to try it. Wow! This one is amazing.